I love this toner, it feels refreshing when applied and also makes my face feel fresh after using. It leaves no stiffness, which for me is good as my face can get stiff with certain products, but with this one it doesn't. I wanted a good toner to add something a bit extra to my skin routine, I am glad I went with this one because it has lasted a long time, considering I use it once maybe even tiwce a day. The only thing with this product, it hasn't made my pores smaller. My pores aren't big at all really, but I persoanlly feel a bit conscience of them. But other than that, I feel happy using this item and would use it again. Anna - Really does reduce pores! I never thought toners did anything for me until I tried this one! It visibly reduces pores and has improved the appearance of my skin significantly. Will definitely buy again. I purchased a sample size of this product and was really impressed so decided to buy the bottle and incorporate it into my skincare routine - very disappointed. This toner seemed to irritate my skin, leaving it really red again after I had soothed the redness with the PC Redness Relief Cleanser (which I highly recommend). This toner then also caused me to break out really quite badly, on areas of my face I hadn't broken out in before. Customer Care: We are sorry to hear of your experience with this product. Although this is not a common response, we do understand that each customer is uniquely different in how they will respond to products or ingredients. We will be contacting you by email to recommend an alternative product. Customer Care: Hello, and thank you for sharing your experience with us, we are always delighted to hear from our customers. Well done PC - an amazing range of toners covering different skin types, concerns, and giving plenty of choice for individual preference. This worked very well on my combination skin, had an enjoyable sensation when applied with a cotton pad, didn't break me out, or dry my skin, and whilst not making a dramatic noticeable difference, I trust PC's research into the ingredients and know its doing good things for me. Thanks! I have been using this toner for 3 weeks, along with the rest of the range. I find it to be a good toner, easy to use, and I'm happy with it and would recommend. I find this toner gives me a very oily sheen and irritates my skin, leaving little red spots. My skin feels greasy so I'm disappointed as I now have a full tub left! After speaking to customer services I've tried it in different combinations (on it's own after cleansing, with a moisturiser, without a moisturiser, without an exfoliant, etc) and I still have the same itchy and greasy feeling. Disappointing. Customer Care: Thank you for your review. We are sorry to hear this toner is not suitable for your skin. Please contact our Customer Care Team for further assistance. I use this as a moisture booster for all year round to mostly apply on dry/ flaky areas of my very dry/ very oily combination skin to combat the drying affects of bha exfoliants or of spf, moisturizer and makeup with oil absorbing properties. I soak 60% of a cotton pad with the toner and first wipe it over my dry areas to deposit the most product, then wipe what remains over my oily areas. In the mornings if i want a quick cleanse i apply this all over my face then pat my T-zone with a towel. This product is good at smoothing the skin as a primer would and eases makeup application, however on very oily areas (mostly the forehead) this can leave a slight film that shines if too much is applied so powder will be needed in the day to combat this. This toner also calms body rashes. I have sensitive skin but niacinamide does not irritate me - if you find this ingredient does sting then buy the hydralight toner. - a light day or night moisturizer for oily skin in dry weather. - a light to substantial day or night moisturizer for normal to dry/oily combination skin in humid/hot summer climates/seasons. - a quick cleanser and/ or primer for normal, dry/oily, oily skin. 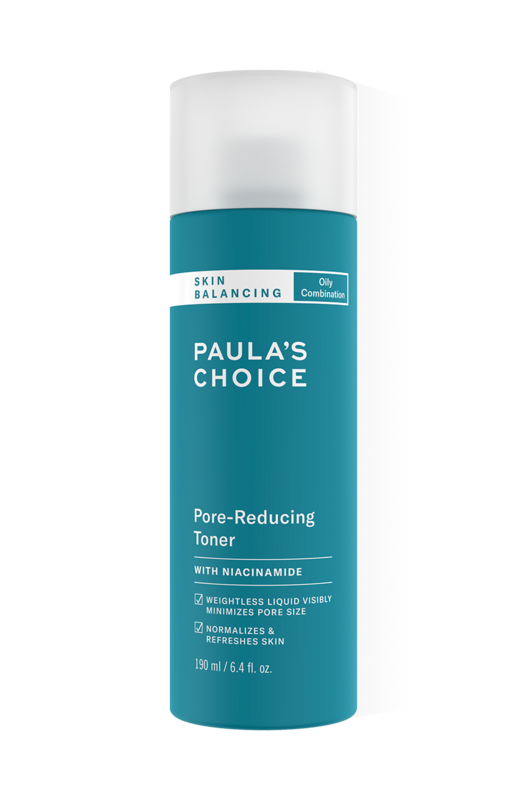 I am a fan of Paula's Choice Skin Care range, but I have to agree with a previous comment- I am also experiencing a horrible oily sheen a few hours after using this toner. Have taken it out of my routine for a few weeks and by using the Clear Cleanser and Skin Balancing moisturiser my skin is relatively shine free for the day. Considering this is a toner suitable for oily skin I've found it actually seems to exacerbate the problem! 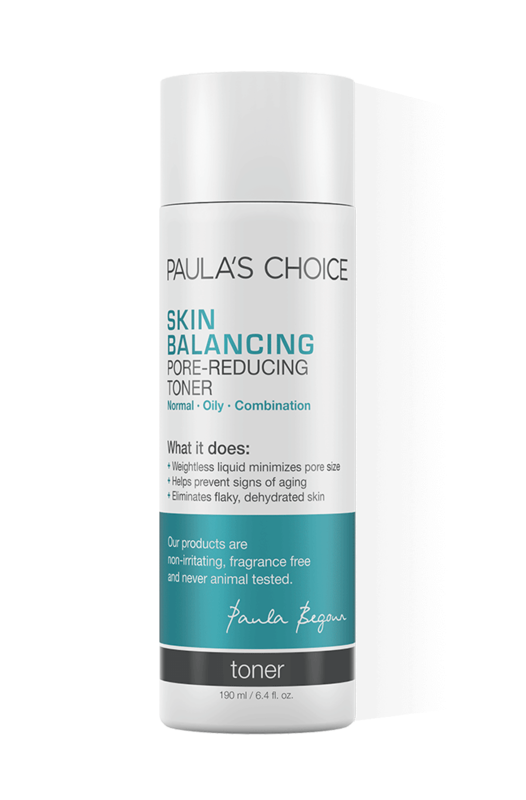 My skin is much less shiny now I have stopped using it- can Paula's Choice please recommend a more suitable toner for me? I suffer from a very oily T-zone. Customer Care : Thank you for your review. We are sorry to hear the product did not produce favorable results for you. The truth is that skin care is tricky. Each person will potentially respond different to products and ingredients. Please contact customer care in the meantime so that we may analyze your routine in order to offer suggestions. Ana - Not the ideal for me. I spent years using expensive products to try to combat my very bad cystic acne in the jaw line and blackheads on my nose and chin with no success. I was very glad to find Paula's Choice products. I’ve first tried the “CLEAR Extra Strength Targeted Blemish Relief Toner” with great benefits, my skin was clear and free of acne, although the blackheads had not disappeared. So I decided to try the “Skin Balancing Pore-Reducing Toner” and had no luck with it, the product leaves my face too shiny, my cystic acne in the jaw line has come back and my blackheads are almost the same. I wish I’d stick to the CLEAR Toner. Customer Care : Thank you for your review. We are sorry to hear the product did not produce favorable results for you. There is a difference between the CLEAR toner and the Skin Balancing Toner. The CLEAR toner although named toner is an exfoliant and the Skin Balancing Toner is more of a tonic. Toners provide skin with a range of antioxidants and skin-repairing ingredients that restore and repair skins surface. This toner is loaded with these ingredients which help restore normal function to skin helping to eliminate the oil, and build-up which causes pores to stretch. TheCLEAR formula exfoliates both the skin's surface and inside the pore, reshaping the pore lining to unclog pores and improve skin cell turnover rate. This creates an improvement in the skin's appearance, feel, and function especially for blemish-prone skin. Additionally, BHA has anti-bacterial properties that attack blemish-causing bacteria. I've never really used a toner before, but was persuaded by the product information and product reviews. I am very happy with this and use it at night after cleansing. It soaks in straight away and I can then follow up with my moisturiser, although normally I find just the toner is enough. I've been using the Skin Balancing line for just under two months now and was concerned that I was still developing an oily sheen on my forehead and nose. I attributed this to Skin Balancing Daily Mattifying Lotion with SPF 15 and Antioxidants being too greasy for my skin. However, that simply isn't the case. The lotion mattifies perfectly. Whilst wondering what product(s) caused the oily sheen, I remembered that using the toner from Simple caused the same problem and when I stopped using it, the oily sheen went away. Low and behold, when I skipped using this toner for a day my skin was nice and matte. I don't if it's the ingredients that my skin can't tolerate or that it just sits heavily on my skin, but this toner leaves an oiliness on my skin. It also causes my chin and nose to go red and on the odd occasion stings when applying it. I'm going to give it 3/5 stars for the excellent formulation and ingredients but the oiliness and redness deduct one star for each problem. Customer Care : We are sorry to hear the product did not produce favorable results for you. The truth is that skin care is tricky. Each person will potentially respond different to products and ingredients. Please contact our customer care if you need any further assistance. I have never left a review on a skin care product before (mainly because they're not worthy of one!) however in this case WOW! What a fantastic product this is, the ingredients are first class and so are the results. Extremley well formulated and gives a genuine reason to use a toner (or start using one!). Will most definitly be purchasing from Paula again, I just wish I had discovered Paula's Choice much earlier and saved myself from Clinique's horrifying Clarifying Lotions / toners! I wish this bottle would last longer, maybe it was just my mine as it seems to have used a considerable amount only after a couple of weeks! I have sensitive combination skin and my normal toner seemed to be ok but this one seemed to irritate the hell out of my face making it bright red :( not a fan of this one.Customer care : Thank you for your review. We are sorry to hear about your findings and we will share your experiences with Paula and her team. It may be difficult to find the right skin care routine for the skin type you are describing (combination skin). The point is that the drier/sensitive parts of the face on the one hand and the oily T-zone and acne on the other hand, should ideally be treated differently. Sometimes problems occur when a combination skin is treated with the same products all-over. Some ingredients which work well for the (oily) T-zone may not be suitable for the drier parts of the face and vice versa. In all cases it is important to avoid the use of products which contain aggressive or irritating ingredients because these may deteriorate the condition of the skin. For the sensitive combination skin you might consider the Hydralight Healthy Skin Refreshing Toner. I was recommended this by a representative of Paula's Choice after explaining the problems I have with my skin. Even though it is a little more money than I would usually pay for a toner it is actually a bit of a miracle worker! It makes your skin feels so refreshed, the only thing I can compare it too is if you've taken a walk on a bit of a windy day and your skin feels alive and fresh. Having sensitive combination skin I've only ever had tingling if not stinging reactions to all the toners I've ever tried. I couldn't believe it when this toner just did it's job without any adverse reaction! I'll definitely continue using. I was initially sceptical of this product as I'd never placed much faith in toners, but after using this product I can say it's great! Doesn't irritate my skin in the slightest and great as a pick me up after cleansing. Rachel - Great great toner! It is an awesome way of leaving a good nice layer of antioxidants and soothing ingredients onto your skin for it to absorb quickly, any time of day or night, but for me especially in the mornings before I apply my sunscreen, just to make sure I have extra antioxidant protection. I love and have tried all of the toners, as depending on the time of the year, the weather, etc. (the eye contour area) I sometimes need one or another.